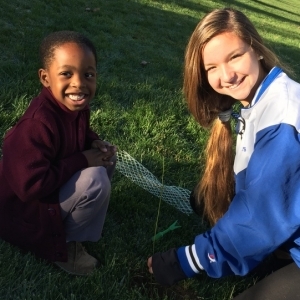 On Monday, November 14th, all 800 students at School of the Incarnation partnered with 50 high school volunteers from Archbishop Curley Curley High School and St. Mary's High School to plant nearly 700 trees on school grounds. In September, the school was notified that an agreement to reforest an area of school property had been signed at the time of the original construction of the school. 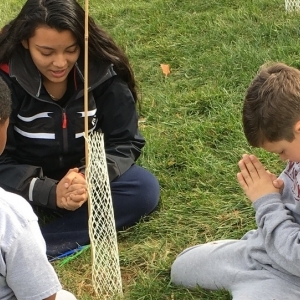 The school administration embraced the opportunity to encourage stewardship of the Earth and live out the words of Pope Francis' Encyclical, Laudato Si'. For the last two months, Mrs. Shipley has been busy working with forestry specialists, the National Arbor Day Foundation and school staff to create Earth Care Day. The day included a morning prayer to bless our work followed by a day of planting where every child helped with planting a tree. Teachers incorporated a variety of environmental educational activities throughout the day. 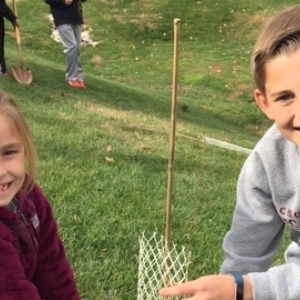 Earth Care Day was a wonderful environmental experience for our students that allowed them to partner with area Catholic high schools and to put our faith into action.